When it comes to building wealth … it doesn’t always matter how much money you make. Of course, having a high paying job can certainly help. But I have seen plenty of people who make a ton of money each year but are flat out broke. Building wealth is not about the money coming in … but more about how much money is going out versus the amount coming in. As long as your expenses are lower than your income … you are in better financial shape than most people. 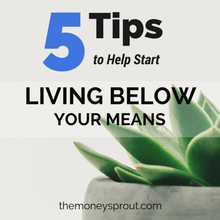 Many people often refer to this (income > expenses) as living below your means. If you want to get serious about your personal finances, then here are 5 tips to help you get started. One of the best things I ever did with our personal finances was to start tracking our historical spending. I don’t believe in having a strict monthly budget … but I do feel strongly about tracking where your money is being spent. The easiest way to track current and past spending that I have found is by setting up a free account with Personal Capital. Since 95% of our spending is done with a checking account or with a credit card, it is simple to link these accounts to our Personal Capital account. All of our transactions can then be viewed together in one easy to use platform. We go through the exercise of tracking our spending at the end of every month now. It gives us insight into where our money is going and can help identify areas we can do better. If you want to start living below your means … you first need to figure out where your money has been going each month. Once you get an idea of where your money is going … the next step is to figure out where you can cut back. Instead of having a strict budget … I suggest asking yourself what you want to afford. Life is short and should be spent enjoying it. Personally, I don’t want to restrict myself from some of the things our family enjoys in life. For example, we are very conscious about our health and the foods we eat. Based on our lifestyle, we spend a lot more money buying unprocessed, organic (when possible) food. Buying healthy food is something that we want to afford. On the other hand … almost a year ago … we decided that cable tv was something that we didn’t want to afford. So we stopped our service and are now saving over $1,000 annually. There is no right or wrong answer when it comes to deciding what you want to afford. Every person and family are different … so what works for us may not work for you. The point here is that it is still possible to afford some of the things you want … while still living below your means. You don’t have to give up everything. Guess what comes to the top of our list when it comes to things we want to afford? The answer is investments. We make saving (which leads to investing) our top goal each month. After buying healthy food … savings is our highest priority on what we want to afford. 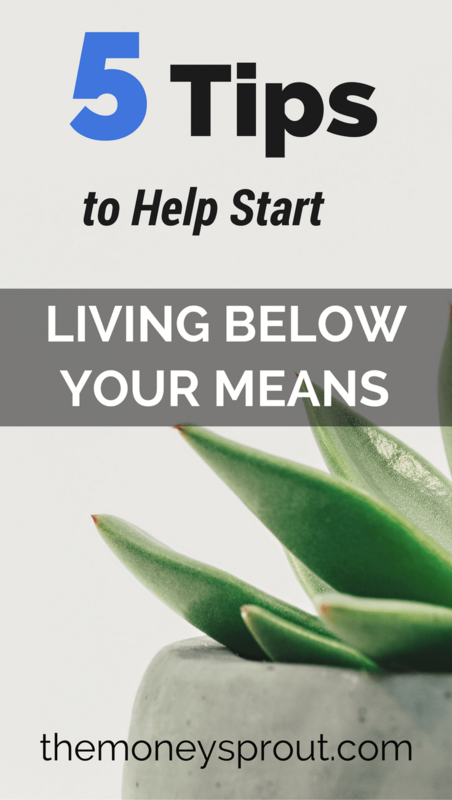 If you want to build wealth and grow your net worth … then living below your means is a great start. But you also need to make as much of your money work for you earning more income. Our family has been focused on building a solid dividend income stream for the past 9 years. Each year our earnings continue to grow at a steady rate and will continue to do you in the future. Savings and investing has become a priority for our family. Remember all those things that you want to afford? Make sure that you are earning cash back or rewards on as much of it as possible. For example, I mentioned earlier that my wife and I use a checking account or credit cards for almost all of our spending. Well, anytime we use our credit card(s) – we are earning cash back. On average, we earn probably $300 or more back every year just in credit card rewards. Since we are living well below our means … we are paying our card balances off every single month. So we are not paying any interest on our credit card balance. And we have cards with no annual fees. As long as you are disciplined … credit card rewards are about the easiest money you will every make. Another option to earn cash back is to use tools like EBates to earn rewards for online purchases that you make. Who doesn’t buy things online? I have mentioned it here many times already … but I am not a fan of having a strict budget. However, in order to live below your means … you need to obviously spend less than you earn – which isn’t always easy. Another option to consider (in combination with saving more) is to increase your income if you can. Side Hustles have become a very popular topic these days in the personal finance world … and for good reason. Earning a couple extra hundred dollars (or more) each month can make all the difference in being able to live below your means. Living below your means is great. But what does it really get you by spending less money than what you make? If you are at all interested in building wealth and increasing your net worth … then you absolutely need to live below your means. In fact, you need to live well below your means. Once you are living below your means, you can invest in income producing assets (like we are in #3) that will earn you more income. It is all about widening the gap between your liabilities (expenses) and assets. What tips can you provide those wanting to live well below their means?